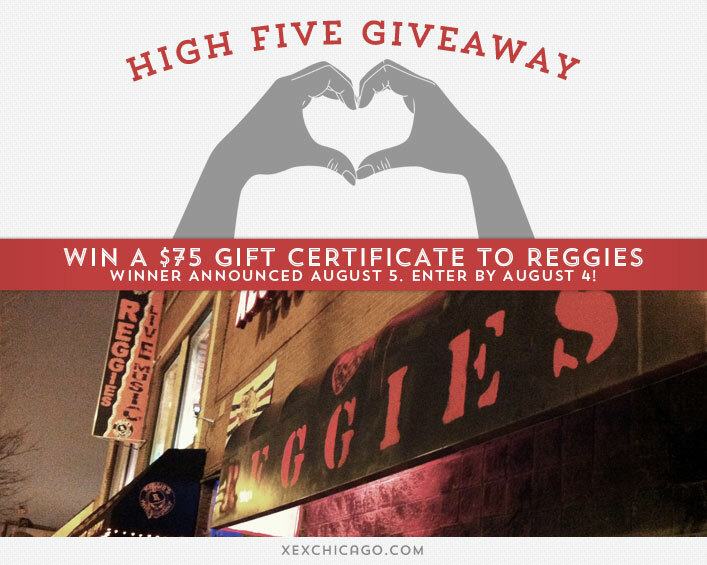 Win a $75 Gift Certificate to Reggies! Congratulations to Erica Hynes on winning our forty first High Five Giveaway! Thanks to all who entered. Our next giveaway is for a $75 gift certificate to Reggies. The gift certificate can be used in the rock club, music joint, rooftop bar and deck or in the record store! On September 8, 2007, Reggies opened its doors, transformed from a once run-down auto bumper repair shop. Now home to one of Chicago’s hottest music scenes. REGGIES’ MUSIC JOINT – our laid-back bar and grill with great live shows, feels like it’s been a neighborhood fixture for years. REGGIES’ ROCK CLUB – our close-up-in-your-face concert venue, with special emphasis on innovative, cutting-edge bands. REGGIES’ RECORD BREAKERS – pour through our impressive selection of new and used vinyl, CDs, memorabilia, posters, cool t-shirts, buttons, and other surprises. REGGIES’ ROOF DECK – enjoy food and drinks atop one of the coolest rooftops in the city. Play free pool, bags, and shoot hoops before cooling off with a nice cold shower. REGGIES’ ROCKIN’ BUS – complete fleet of vintage buses ready to run to the game, concert, local event or road trip. Roll with us and don’t fight traffic or pay for parking. Our buses are available to get your group to the show, party or event. Reggies is located at 2105 South State Street. Visit their website at www.reggieslive.com or call them at 312-949-0120 for more information. What Aveda product helps to keep your hair from becoming dull during the Summer? Now, just add a comment to this post with the right answer to be eligible to win! The winner will be announced on Monday, August 5. Entries must be received by midnight on Sunday, August 4. Aveda’s Color Conserve Shampoo and Conditioner. Aveda’s color conserve shampoo, color conserve conditioner, and daily color protect. Love Aveda! Aveda color conserve shampoo, conditioner and daily color protect. I like Aveda’s mint shampoo and conditioner !!! Love Aveda’s mint scented shampoo and conditioner!!! I love Aveda’s color conserve shampoo, color conserve conditioner and daily color protect. Aveda is awesome !!! Aveda’s Color Conserve Shampoo and Conditioner!! Use Aveda’s Color Conserve Shampoo and Conditioner to keep your hair from becoming dull during the summer! Aveda’s color conserve shampoo and conditioner and also daily color protect. Aveda’s Color Conserve Shampoo and Conditioner and Aveda’s Color Conserve Daily Color Protect. Aveda’s Color Conserve Shampoo and Conditioner. Also, I LOVE, LOVE, LOVE the fact that they do absolutely no animal testing. Aveda’s Color Conserve Shampoo and Conditioner, as well as Daily Color Protect!